It was 50 years ago that the Porsche 911 made its world debut in Frankfurt and ten years later the 911 Turbo was born. On this 40th anniversary of Porsche’s most dynamic and performance oriented 911 range, the new-generation 2014 911 Turbo and Turbo S have raised the bar even higher for performance and efficiency. While most of us won’t be able to run out and buy this exciting sports car, we sure do like to read about this kind of performance. What can we expect to see from Porsche as they reveal the specs on the new 911 Turbo and Turbo S? The technology and performance of the new generation 911 Turbo and Turbo S is absolutely astounding. But why would the average person be interested in an ultra performance car that is price from $148,000 for the Turbo and $181,100 for the Turbo S? And you can add in another $950 for destination charges. It’s because this kind of technology is developed on the race track and ultimately filters down to the cars that you and I drive everyday. So how fast is the new 911 Turbo and Turbo S? You might want to cinch up your seat belt a little extra tight as we start up the 560 hp twin-turbo powerplant in the S model. And even 520 horspower in the turbocharged 3.8-liter six-cylinder engine with direct fuel injection in the 911 Turbo is nothing to sneeze at. That’s up 20 and 30 horsepower, respectively, over the outgoing models. And then buyers can choose the optional Sport Chrono Package Plus and go even faster. 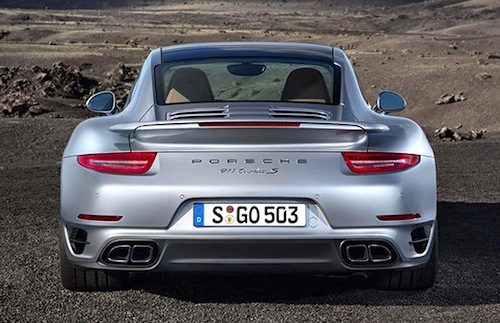 The 2014 Porsche 911 Turbo with the optional Sport Chrono Package Plus accelerates from 0-60 mph in a neck-snapping 3.2 seconds, with a top track speed of 196 mph. Of course that’s if you can find a track here the U.S. long enough. If you are lucky enough to get behind the wheel of the new 911 Turbo S, you can get ready to launch the ultra performance sports car to 60 mph in just 2.9 seconds, with a top track speed of 198 mph. Now that’s the kind of performance that will excite even the most seasoned race car driver. How did Porsche do it? Porsche has been racing their performance 911 for years and the technology has made it to the cars that can be driven on a daily basis. Although we can’t imagine having one of these all-wheel-drive sports cars in the garage and driving it to work in the snow. The new generation 2014 911 gets an entirely new chassis and lightweight design with a 3.9-inch longer wheelbase and larger 20-inch wheels. It also features the Porsche Dynamic Chassis Control (PDCC) active anti-roll system, which is being offered for the first time in 911 Turbo models. Where could an owner ever release the full potential of these ultra performance cars? There is a famous track in Germany called the Nurburgring that allows automakers to test their latest performance cars. The new 911 Turbo S shortens the lap time for the North Loop of the Nurburgring to well under 7 and a half minutes, and that is with standard production tires from the showroom. This is one of the few places on the planet for a driver to experience the full effect of the new 911 Turbo. If we had the money to buy one of these performance sports cars, I’m not sure we would really care about fuel consumption. But just in case you want to know, Porsche has increased the fuel milage on the new 911 Turbo. Porsche hasn’t released exact numbers, but with a new auto start/stop function with engine shutoff, a combined thermal management system for the turbo engine and the PDK transmission, Porsche says they are projected to result in real world fuel economy improvements when they finally reach U.S. shores. The interior of the new 911 Turbo has also been completely redesigned for more comfort while going 198 mph with Sport Seats Plus with 18-way adjustment and memory. And for the person who drives fast on the highway, the new radar-controlled cruise control system will help keep a look out for the local law enforcement. While most of us can only read and dream about owning one of these ultra performance 911 Turbos, the new top models of the 2014 Porsche 911 Turbo and Turbo S model series will arrive on U.S. shores at the end of 2013. Watch The new Porsche 911 Turbo - first exclusive look video.